Unlike other practices of meditation, dealing only with the mind (mantra), or only with the body (yoga), or only with emotions (bhakti), which often led to discrepancies that had to be adjusted through various rituals and beliefs, the practice of meditation presented here, encompasses all these dimensions of the man in a harmonious unit. You will see how a human being is composed of all the dimensions of nature, a human being is a microcosm, and therefore, meditation is complete only when the man is being conscious on all dimensions, not only in the body and mind. Such meditation is inherently complete and does not require any supportive means in the form of ideological and religious preconceptions. The meaning of meditation in this book is related to the meaning of man's existence and the consciousness of his soul, to what we were before birth and what we will be after this life, to what we are in absolute terms. Meditation is the connection with the consciousness of the soul, and it is the divine consciousness within us, while beyond it is the consciousness that enables everything, the entire nature. 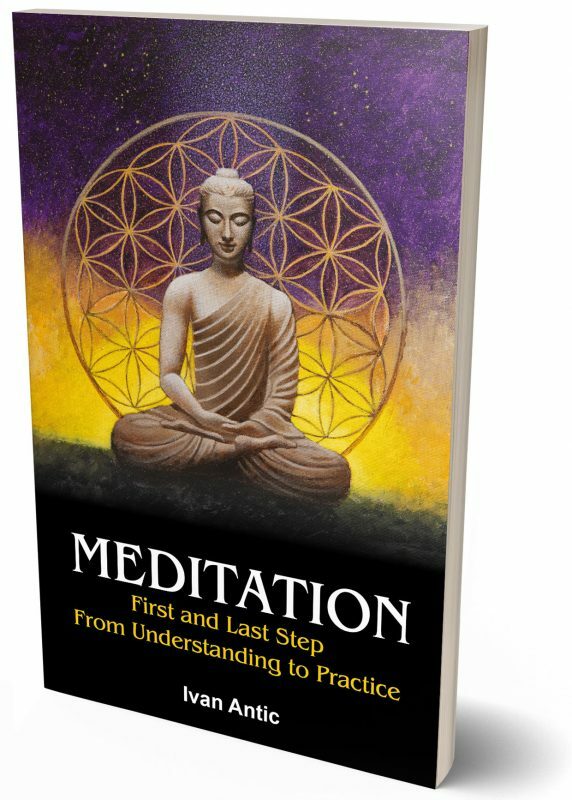 In order to understand this connection of the mind and the divine consciousness of our soul, in this book, this spiritual sense of meditation is connected with the latest scientific discoveries of the essence of nature. You will discover how the consciousness of your soul is related to the quantum field and the physics of ether, which is the same physics that Nikola Tesla used to create the basics for all modern technology. You will find out what the non Hertzian frequencies through which the physics of the ether works are, how they are related to our thoughts and the creative effect of thoughts on the matter, you will discover that the powers (siddhi) are actually the effect of the non Hertzian frequencies of quantum mind awareness on physical, Hertzian frequencies. The philosophy of Advaita Vedanta on the unity of everything is well-known; that our essence (Atman) is actually the Absolute (Brahman) himself. Instead of mechanically repeating it as a formula, here you will find out how this unity actually happens; in reality there is no such thing as a multitude of subatomic particles but only one single 'divine particle' that vibrates at the present moment, much faster than light, according to the principles of fractal geometry and the golden section; therefore here, to us, it seems that there are plenty of particles, things and phenomena. These vibrations create energy, and therefore existence is essentially pure energy. Since that one particle is a reflection of the divine consciousness, everything is essentially pure consciousness. You will see all the evidence that consciousness is not in the body, but that our body only uses the divine consciousness which is in the essence of the very nature. Our brain does not produce consciousness, but only slows down the current divine consciousness that enables everything in a slow enough phenomenon so that reality, which is essentially a divine consciousness, looks to us like a matter separated in space and time. You will find out that through meditation in dreams you conquer higher dimension through out-of-body experiences and how these experiences are related to empathy, the emotional maturity that connects us with the unity and the divine consciousness here in reality. In short, this book associates the earliest spiritual knowledge with the latest scientific; in a practical description of how to apply it on yourself and thus understand its meaning through the realization of your sense of existence. Meditation is a method with which the man becomes completely realized and present in existence, in all dimensions, and even in this physical reality, truly unconditioned and authentically himself. Only with meditation the man starts to truly exists – frees himself from the illusion that he started to exist with physical birth, the illusion of physical body. In that way, he brings the consciousness of his soul, which he had before his birth, to the full existence during the time of his physical life. That is the aim of meditation. In this book, we will see all the details of that accomplishment. Meditation or contemplation is a method which awakens a man in the realization of the reality in accelerated way, or more precisely, a method with which is removed the illusion of the time during which we imagine that we are something else, and not what we are in reality, that we are separated from the highest reality. With the meditation, the man is harmonizing with reality. Harmonizing with reality is the teaching and a practice of meditation. Meditation is joining with the consciousness of the soul which we had before being born into the body, and which we will have after the death of the body. That is why it is so attractive to people with mature souls too, with even the slightest hint about what meditations brings, even though it is still unclear, to give enormous energy and inspiration for enhancement, for further practice. Meditation is a systematic awareness which is otherwise never happening in the nature and in the existence spontaneously or by itself. Only in the consciousness of Absolute is happening the similar awareness of itself as it is happening in the man who is in the deep meditation, in samadhi. The man in meditation, therefore, repeats the essential awareness of Absolute according to which exists everything that exists, he is returning to original divine consciousness, since he could never be outside of it, because it is everything that is, that returning is experienced only as a revival and awakening. The practice of meditation, which will be presented here, is based on the texts from Patanjali’s Yoga Sutra, (YS), Buddha’s Great Speech on the Foundations of mindfulness (Mahasatipatthâna sutta) and Brief Speech on Emptiness (Culasunnata sutta, M. 121); instructions for sitting in the zen meditation by Jasutani-roshi (Haku’un Yasutani, 1885-1973) and my personal experience in meditation during 37 years.